One of the many reasons Smitten Kitchen is so amazing is that all of her recipes work…exactly as she shares them. This beauty is no exception – the perfect amount of perfect crust in a perfectly sized pan with the perfect amount of filling. I made the crust ahead, and I’d say that the time spend here is rolling it out – it’s a big pie! Perfect for a crowd! We enjoyed ours with vanilla ice cream, but the cut ‘squares’ are solid enough to eat with your hands…say, at a picnic – so many great things to say about this pie! – enjoy! Whisk together the 3 dry ingredients in a large bowl, then using a pastry cutter or your fingers, work the butter into the flour mix until the largest pieces of butter look like peas. Stir in the water with a sturdy spatula and mix until it starts to come together, then use your hands to knead it a couple of times to get the whole mass into a ball – here’s where you may need to add a splash more water. 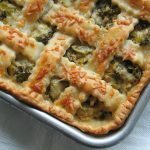 Divide the dough into 2, roughly equal pieces – if one is slightly larger (I weighed mine), then use it for your bottom crust. Wrap each half well, flatten them a bit, then chill for a least a couple of hours (I prefer overnight…plus the pastry gets made ahead). You can freeze this as well, simply allow it to sit in your fridge overnight before making your pie. Making your pie – preheat the oven to 375 and line your 15 x 10 x 1-inch baking sheet (jellyroll pan) with parchment. In a large bowl, toss the apples with the lemon juice, then add in the remaining ingredients and stir well to combine. On a lightly floured surface (I have a marble slab that I keep in the freezer for moments such as these), roll out the larger of the pastry discs into an 18 x 13-inch rectangle – you’ll need to work quickly due to the butter! This doesn’t have to be perfect, but make sure you give yourself a bit of extra room in the corners so that you have enough pastry to tuck into the edges of the pan. Carefully transfer the pastry to your prepared baking sheet and arrange it so that it’s slightly pressed into the bottom edges and also so there is a little bit of overhang. Pour in the filling and spread it out evenly. Roll the second sheet of pastry into a 16 x 11-inch rectangle and drape it over the filling, then fold over all of the edges around the entire pie to seal the top and bottom crusts together. Cut small slits all over the top of the pie for ventilation (and decoration), brush the entire top with the cream (or egg wash) and then bake for 40 to 45 minutes until the crust is golden and the filling is bubbling. 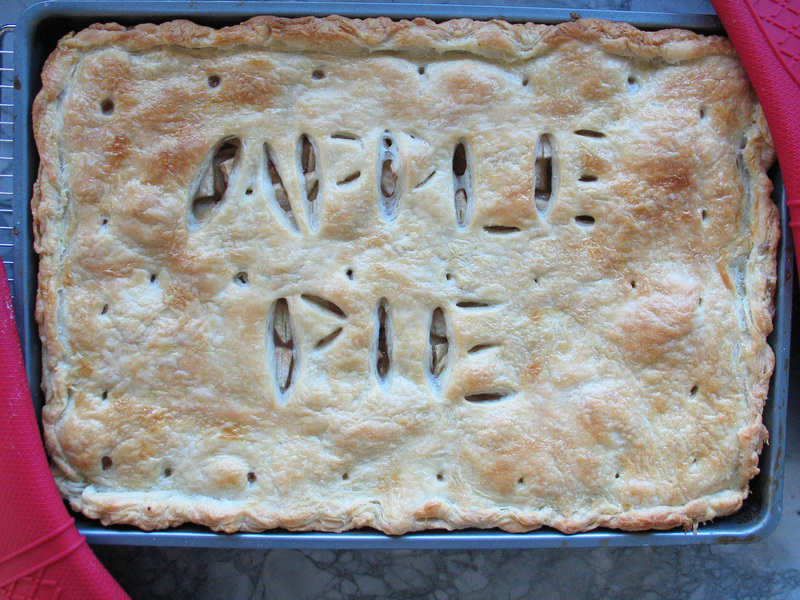 Allow the pie to cool for about an hour before attempting to slice it and then serve warm or at room temperature.